This butternut squash chili is the perfect comfort food during the chilly fall and winter months. Bonus, it's also Whole30 compliant, Paleo friendly, and SO EASY. You know what you can never have too many recipes for? Chili. Yep, this is my fourth chili recipe on All the Healthy Things and there will probably be a few more because chili is honestly just the best. It's so versatile and so easy. You can make it on the stove top, in a slow cooker (like I did for this recipe), or even in a dutch oven. I think I love chili recipes so much because, essentially, you just throw a bunch of ingredients into a pot, cook it for a little while, and then you have a meal. Who doesn't love that? Chili is like the perfect food for busy people who just don't have the time to be standing over a stove all day. It's also a great meal prep option if you're into that kind of thing. Now, I know what you may be thinking, "butternut squash chili? sounds...different." I was skeptical at first as well, but I promise you it's good. When I first started eating a Paleo diet, I cut out all beans and legumes. Beans and legumes have the potential to be an inflammatory food and may cause stomach discomfort. Cutting them out of your diet for a period of time, and then adding them back in to see how you feel, can be incredibly helpful experiment for some people. Thankfully, I've learned that beans don't cause me any kind of discomfort, but when I was following a more strict Paleo approach I had to come up with a replacement for them when I made chili. Instead of beans, I started using butternut squash and you know what? It's delicious. 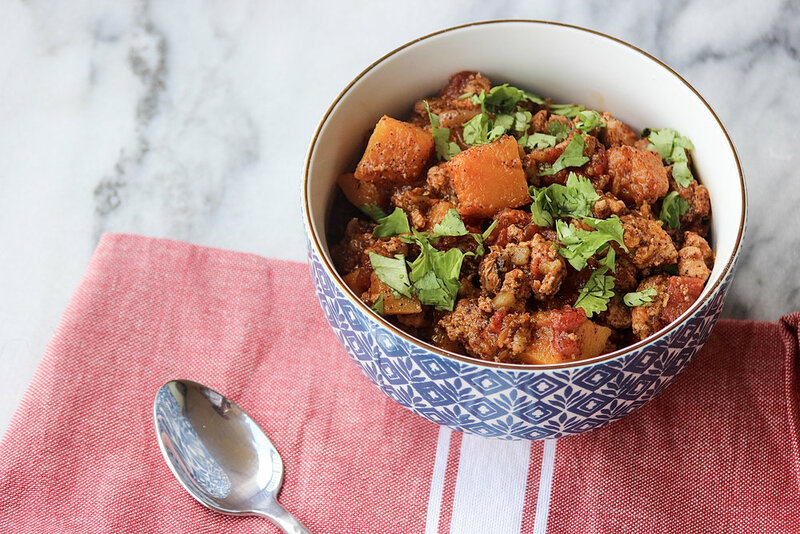 Butternut squash has subtle sweet flavor that I think pairs perfectly with the chili powder, plus it's an easy way to get an extra serving of veggies in your day. And who doesn't want a simple way to add more vegetables to their diet?! This recipe calls for ground turkey instead of ground beef to switch things up a bit, but feel free to use ground beef if that's what you have on hand. Also, butternut squash can be a real pain to peel and dice, so I usually buy pre-chopped butternut squash to keep things extra simple and easy. No point in making things harder than they have to be! HEY, FRIENDS! I WANT TO SEE WHAT YOU'RE CREATING! Heat 1 tablespoon of oil in a sauce pan or skillet. Add the ground turkey to the hot oil and break the meat up into small pieces as it cooks. When the meat has begun to brown, add the diced onion to the pan and stir as it cooks. Once the meat is cooked through, add the spices to the pan and cook for a few more minutes. Then, turn off heat. Add the meat mixture to your crockpot along with the butternut squash, broth, tomatoes, and green chilis. Give it a taste to see if it needs more salt or spices to your liking. Cook on high for 4-6 hours or on low for 6-8 hours or until the butternut squash is tender. Top with fresh cilantro and your favorite toppings and enjoy!